Improving but not there yet. 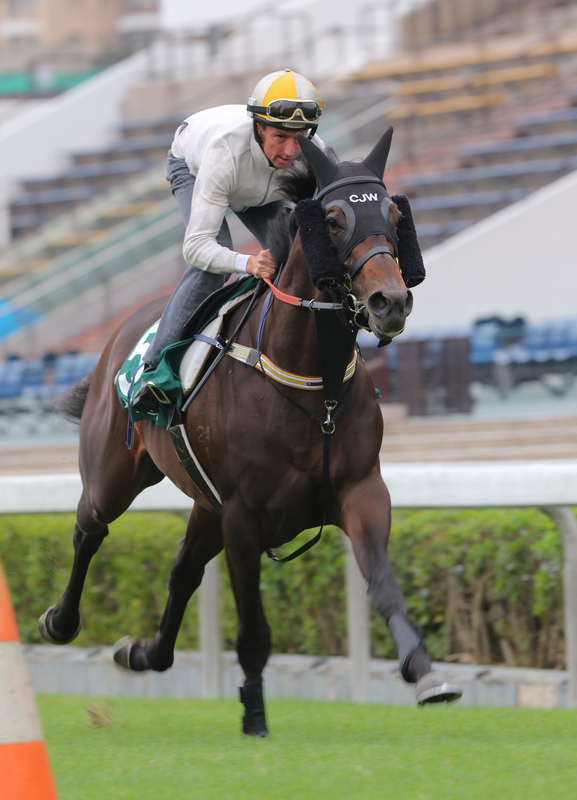 That was the optimistic treatment with which we've painted the Sha Tin gallop yesterday of Green Mask, America's globetrotting candidate for this year's Longines Hong Kong Sprint. Ridden by Joao Moreira as a favour to his friend, trainer Wesley Ward, Green Mask zipped over 800 metres on the main turf track, clocking a brisk 47.3 seconds. The four-year-old zipped home in 22 seconds, and reserved the best for last, scampering home in 10.96 seconds for the ultimate 200m. The good news is that, as the times imply, Green Mask stretched out well in the final stages, not changing legs repeatedly the way he did in his December 1 gallop. The bad news is that he's still not comfortable turning right handed. The pessimistic view is that he's almost no chance of correcting the issue by showtime on Sunday. Why is it so, you may well ask? Surely a horse can adjust to a galloping in the opposite direction with a bit of practice? And it's not like the Sha Tin corners are tight ones like those he'd be familiar with stateside. Let's answer that proposition with a football analogy: if you are a natural right footer, and have always used your best foot exclusively as your strike weapon, how do you cope when the soccer coach says you're only allowed to use the left foot from this moment forward? How long would it take you to have equal skill shooting with the left boot? One whole season, maybe, but not two weeks. History also provides us with a precedent. Kip Deville, an outstanding US galloper, arrived amid great fanfare for the 2008 Hong Kong Mile. He arrived early, just like Green Mask, in a bid to learn the strange caper of turning clockwise. In one particular gallop, the big grey almost tripped himself over, such was the mess he was making of going right handed. His legs looked like out-of-sync knitting needles. His trainer, Richard Dutrow Jnr, gave him as much practice as he dared, but on race day Kip Deville hit the first turn and kept going - straight toward the outside rail! The problem for thoroughbreds hailing from America is not that they inherently lack the ability to turn right, it is just they have never trained that way. Right back to their yearling days, when breaking in, all horses in America work anti-clockwise, every day. They have years of training their muscles for this specific task and they don't actually have the muscles to make their chassis track the other way. Moreira will not be riding Green Mask on Sunday. He has a long-standing booking for Tony Cruz-trained Peniaphobia, runner-up to Aerovelocity in the big race last year. One of the unique attractions at this renewal of the HKIR will be Mongolian Saturday, owned by multi-millionaire Mongolian businessman Ganbaatar Dagvadorj. The last-start Breeders' Cup Turf Sprint winner impressed with his steady 800m in 53.8, the last 400m in 22.6 and his final 200m in 11.09. Like Green Mask, he was slightly uncomfortable on the corner, but he flattened out nicely in the home stretch, maintaining his stride and looking strong at the finish. Australian stayer Preferment, handled by Nash Rawiller, impressed with his fluent stride, working a steady 800m in 56.2 seconds, the final 400m in 25.7.